Network attached storage devices are widely used for storing business critical data. NAS devices let you build simple and centralized local data storage systems, which can store and serve files across your entire network. However, the fact that your NAS devices are also vulnerable to virus attacks and hardware crashes cannot be ignored. And you could easily lose all your files to data disasters, if you rely only on your local NAS backups! IDrive's online data protection is all you need! Online backup for your NAS data is the best way to ensure that you never lose your files. A single IDrive account which backs up all of your computers and mobile devices, can backup your NAS devices too. IDrive speeds up your initial data backup using IDrive Express™ that transfers data within a week via physical shipment of hard drives. Data is protected using 256-bit AES encryption with an optional ‘Private Key’, not stored anywhere on IDrive servers, so only you can access your files. You can backup your NAS devices using IDrive desktop application. Simply, add the NAS device as a mapped drive on a computer running the IDrive application and add the NAS mapped drive to your backup set. 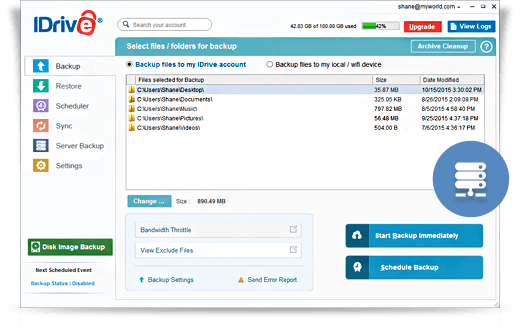 With your next backup, your NAS data is securely backed up to your IDrive account. 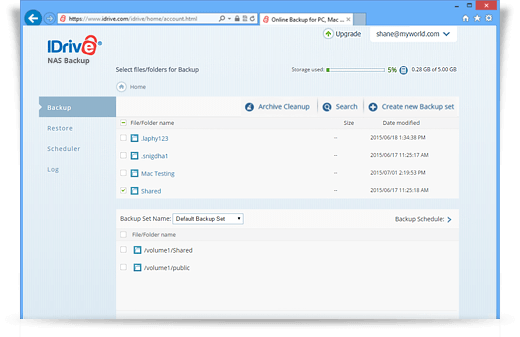 IDrive offers browser-based applications that can directly backup your Synology, QNAP, Netgear and Asustor NAS devices. Using the apps, you can conveniently backup your NAS devices, receive notification on scheduled job completion via emails, and track your account activities through the logs. * Note: For some accounts, IDrive NAS Backup may not be available.